This is the second post in a series investigating the passage of the Animal Enterprise Terrorism Act. Internal lobbying documents produced by an industry front group, revealed here for the first time, show how and why corporations snuck the Animal Enterprise Terrorism Act through Congress, with little discussion or debate. On the surface, it might appear as if this “eco-terrorism” law–which labels non-violent civil disobedience and harming corporate profits as “terrorism”–passed Congress with substantial support: It passed the Senate by unanimous consent, and it passed the House on a voice vote. But an anonymous source has provided me with some of the lobbying documents of the Animal Enterprise Protection Coalition, an industry front group that urged passage of the law. [The previous post in this series has more on the coalition, and how they kept corporate members “on message” with their terrorist scare-mongering. UPDATE: The AEPC website was taken down after the first post, and the link isn’t working]. These documents paint a very different picture of the law’s passage, and show that supporters were very well aware of a lack of Congressional support for their bill. 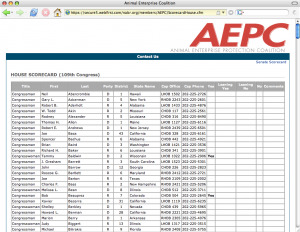 So how many members of Congress did the Animal Enterprise Protection Coalition believe it had on its side? 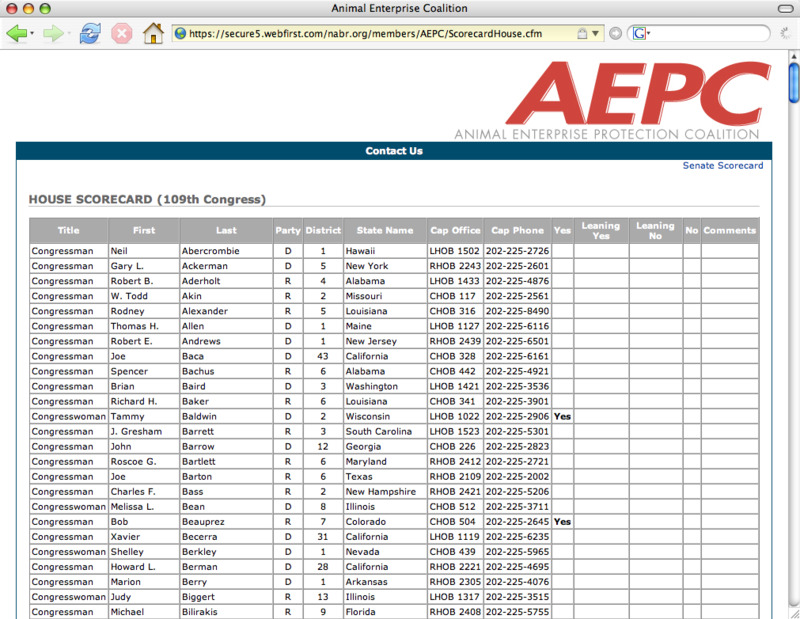 According to the AEPC’s House scorecard, of the 435 members of the House: 27. That’s 6.2 % of the vote. According to AEPC’s Senate scorecard, of 100 members of the Senate: 4. That’s 4 % of the vote. These should be treated very conservatively, of course. For one thing, most of the rows and columns are blank, and only solid “yes” votes are marked. Lobbyists might have been erring on the side of caution, which is normal, and only marking the most solid votes. Also, these are dated 9/30/06: the law had already passed the Senate, but it had not yet passed the House, so there’s a slim chance more votes might have been added in the next few days. That being said: 4 Senators and 27 Representatives. Even with scare-mongering ads in Capitol Hill publications like the one featured above, they still didn’t have the votes they needed. With those numbers, this legislation would crash and burn on the House or Senate floor. Corporations and industry groups needed another plan. Prospects for this legislation looked even more grim when the November, 2006 elections marked a shift to Democratic control of Congress. Even with so few supporters, it was the best chance these groups had in years to make sweeping expansions to “terrorism” laws. Without the votes, they needed a backdoor plan. In the House, the bill was snuck through on the very first day back from Congressional recess. As members of Congress were on the National Mall breaking ground on the new MLK memorial, some lawmakers were labeling King’s tactics as “terrorism.” The Animal Enterprise Terrorism Act was passed as part of the suspension calendar, which is a procedure used to expeditiously deal with non-controversial legislation. Six members of Congress were in the room. Only one spoke up against the legislation, Rep. Dennis Kucinich. However, Kucinich did not call for a roll call vote, a move that would have shown that there were only a handful of lawmakers in the room and stopped the passage of the bill. That week, the procedure was also used to honor the St. Louis Cardinals for winning the World Series. Previous post: Are You on Twitter?